Explanation: Where are these gas clouds going so quickly? 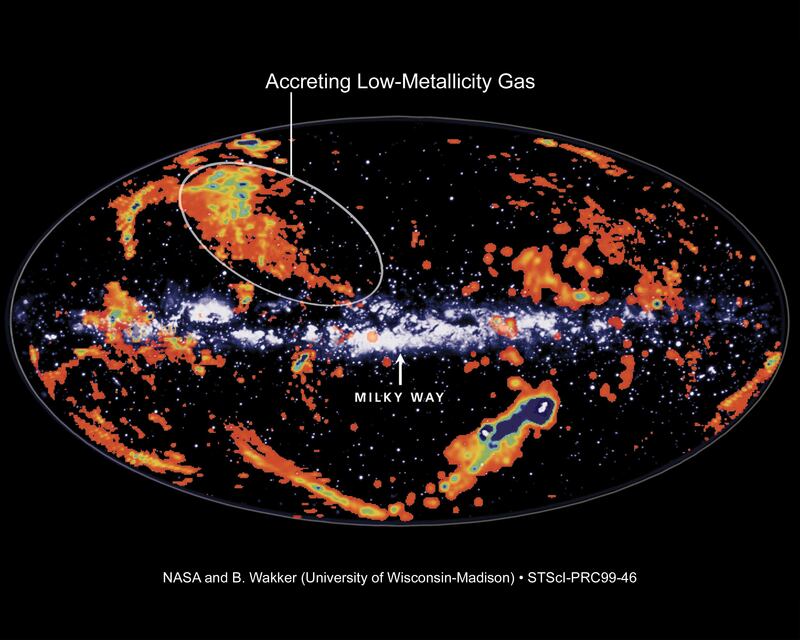 High velocity clouds (HVCs) of gas have been seen for decades but their origins and destinations have remained mysterious. 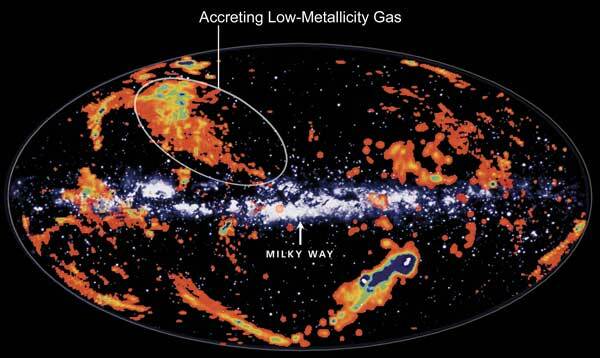 Recent measurements have now placed at least one of these clouds in the halo of our Milky Way Galaxy, while other measurements have determined the relative abundance of cloud elements. Of the two clouds measured, each appears to have a chemical abundance consistent with a different origin. One HVC has been measured to have very few heavy elements ("low metallically") compared to neighboring stars, while another HVC has been inferred to have a heavy element abundance more typical of neighboring stars. Hypotheses are therefore being investigated that some HVCs are local gas remnants being pushed away from our Galaxy by supernova explosions, while other HVCs are ancient dwarf galaxy remnants falling toward our Galaxy. The latter possibility is particularly interesting as it might help explain how our Galaxy can continue to make stars at the observed rate. Fast moving HVCs are circled in the above false-color mosaic.